WEST LAFAYETTE, Ind. — First, Purdue took a page from Michigan State’s playbook. Then Nojel Eastern rewrote the script. Ryan Cline scored 17 points and Eastern overcame his season-long free throw troubles by making six straight down the stretch to help the Boilermakers fend off a frantic late charge and hang on for a 73-63 upset Sunday over the sixth-ranked Spartans. Purdue opened with a 19-6 run, extended the margin to 23 midway through the second half before nearly giving it all away during a drought in which it missed eight straight shots. Michigan State took advantage by going on a 24-5 run to cut the deficit to 60-56 with 5:14 to play. But just when it looked like the Boilermakers (14-6, 7-2 Big Ten) might crack, Eastern, a 50 percent free-throw shooter, was fouled three times in a row. He made all six to give the Boilermakers a 71-60 lead with 2:35 left. 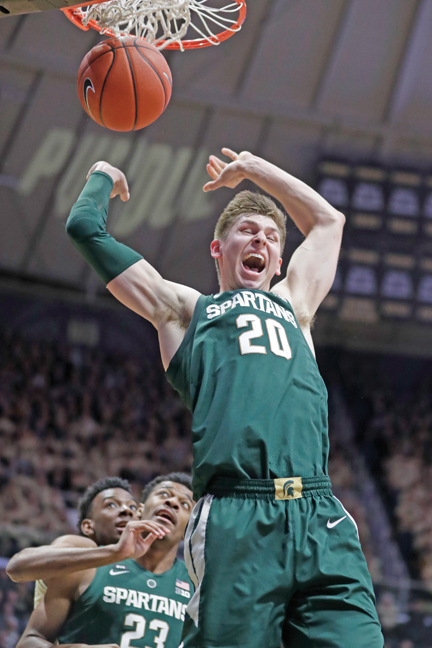 Michigan State (18-3, 9-1) had three significant winning streaks end — a 13-game streak that dated to November, a 21-game regular-season streak against conference foes and a 12-game road streak in league play. To coach Tom Izzo, the obvious was difference: Purdue played better defense, was better in the paint and had a better supporting cast. Purdue has won four in a row and 12 straight at home. Preseason All-American Carsen Edwards scored just 14 points. He was averaging 24.7. But the Boilermakers made up for it by getting five 3-pointers and four assists from Cline, three 3s and 11 points from Aaron Wheeler, 10 points and eight rebounds from Matt Haarms. Edwards had four rebounds, three assists and three steals and Eastern wound up with 12 points — the last six at the line. “You know if he misses a couple front ends there, you’re in a different position and you have a different feeling,” Painter said.